If you haven’t heard, Arizona Breakfast Weekend is returning this July! Organized by the Arizona Restaurant Association, Arizona Breakfast Weekend united Valley chefs and restaurateurs for an event that celebrates the most important meal of the day: breakfast. The second annual Arizona Breakfast Weekend hits eateries July 28-31. Diners will enjoy special dishes at breakfast and brunch spots offered at $7, $10 and $15 price points. We were recently treated to a preview of Arizona Breakfast Weekend at Original Breakfast House. Let us tell you, they have really set the bar with their offerings! Delectable delights like Pulled Pork Hash and Eggs, Triple Berry French Toast, and Fresh Peach Pancakes are among the choices on their ABW menu. Also showcased, were some of their “side dish” offerings which are meals in themselves! So much fantastic food was served that we didn’t try even a fraction of the offerings! 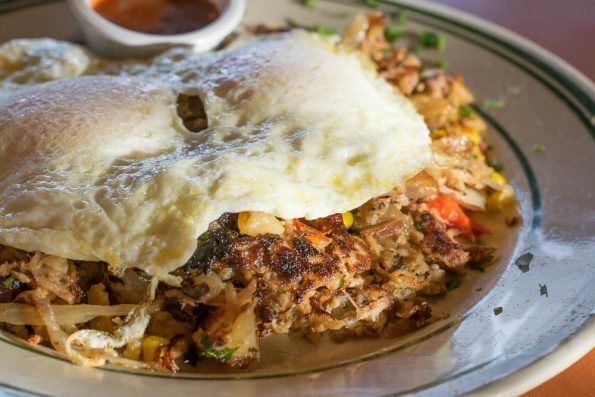 We did gobble up the Pulled Pork Hash and Eggs which featured some of the most perfect sunny side eggs we’ve ever seen! We didn’t get a photo, but their Biscuits and Gravy are out of this world good! We’ve said for a long time that Phoenix is lacking a spot that has great Biscuits and Gravy (we were totally proven wrong), well now we have a spot for them!. We also tried the Triple Berry French which was deep fried to crispy perfection! How Original Breakfast House has not been on our radar sooner is beyond us! They are a fantastic breakfast joint! We’ve heard that they are pretty popular on the weekend, so if you don’t like a wait get there early. We will tell you though, they are definitely worth the wait! 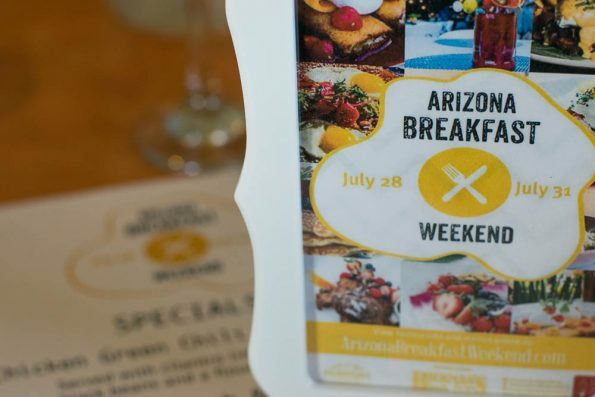 For more information about Arizona Breakfast Weekend and restaurants involved visit: http://arizonabreakfastweekend.com/restaurants/phoenix/. Where will you be heading for Arizona Breakfast weekend? We’d love to hear all about it! Leave a comment below or tag your photos with the #GeekEats hashtag! We adore breakfast photos!